The Alps are incredibly beautiful and also is comprehensive mountain area, which in every part has something to offer to its many visitors. 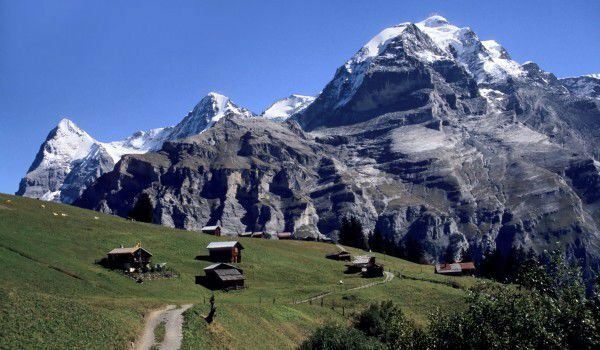 One of the leaders of the Swiss Alps is, Mount Jungfrau , which is the highest point of the same name mountain range. This majestic peak is located in Berner Oberland, in the western part of the country and rises above the beautiful town of Grindelwald. Jungfrau is considered one of the most emblematic of the Switzerland tops. Rising to a considerable 4158 m in altitude, it is surrounded by two unique mountain heights - Eiger and Mönch. 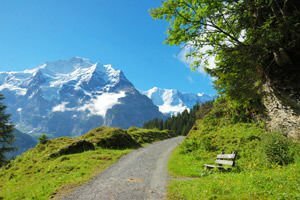 Today Jungfrau remains the top challenge for experienced climbers, but for those who cannot go to the highest point on foot, then the railway Jungfraubahn is the easiest option to get you to the massive peaks. Located at an altitude of 3454 meters, the railway station is the highest railway station across Europe. The first leg of the mountain Jungfrau was launched in 1893. It takes tourists to a height of 784 m, where the station, Lauterbrunen was built. From there the transfer, takes visitors to the mountain station, Kleine Scheidegg which is situated 2029 meters above sea level. At this height you get a lovely view of the top three that make up this part of the Swiss Alps. From there you can take the iconic railway, Jungfraubahn which takes you to the edge of mountain climbing. This last stretch is a long 96 km, 64km from that was dug a tunnel in the mountains. Before you go through it there are two short stops - Eigerwand (2830 m) and Eismeer, which are situated at an altitude of 3110 m. After leaving the tunnel you are at your destination. On this significant level of over 4000 meters the air is highly diluted so it is advisable for people with heart problems to watch. There was built a lift which goes up to the Ice Palace. It is a unique ice palace, consisting of a series of caves. In the ice gallery you can see the real size copies of various objects such as cars, chairs, etc.